Pre-printed and multi-part forms are very expensive. A 2 part form may cost more than 13 cents per page, a 3 part 19 cents per page. 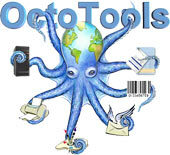 If OctoTools electronic forms are used instead, the cost is roughly 1 cent and 1.5 cents respectively. Calculate your own costs based on cost per form and volume. Forms Cost Calculator. When there are form changes, no forms are wasted. Your disaster site does not have to store forms that can be obsolete. You never run out of forms. Laser and copier technology are more reliable. OctoTools electronic forms allows switching forms on a page by page basis based on input data. This is impossible with continuous preprinted forms. Invoices, purchase orders checks and other documents can have page 1 in as a check or summary page in one format and pages 2-N a completely different format. This is impossible with preprinted forms.. Different paper stocks may be selected for any page of the documents set, based on input data. For example page 1 could be check safety paper and 2-N, standard white paper. In many cases a separate preprinted form is needed for each branch, company or subsidiary. OctoTools allows you to have a single form and modify it based on data or have multiple electronic forms selected dynamically. Using OctoTools, each copy is an original, no more unreadable third or fourth copy. Copies may be printed directly at the location required. A copy can be printed at the sales desk for the customer, another copy at the pickup station and a print or PDF for accounting. Using the same form, for security reasons, a picking/shipping copy may have price information masked (electronically omitted). Customer copies may have internal data (such as cost) electronically masked using a single form design. When printing multiple part forms, usually one goes to accounting for archiving. There are many problems with this approach. There is a cost for an extra form copy. There are significant costs to store copies. They may be misfiled. Retrieval is slow. OctoTools overcomes these problems by archiving a copy as PDF. There is virtually no cost, it is a replica of the original and retrieval is instant.